ICLEI have recently completed the design and implementation of six showcase community projects around the country demonstrating that resource efficiency and sustainability is relevant and beneficial to people across the socio-economic spectrum. The Urban LEDS project has the objective of enhancing the transition to low emission urban development in emerging economy countries. It supports selected local governments in Brazil, India, Indonesia and South Africa and aims to integrate low-carbon priorities into all sectors of urban planning and development. In the first SEA newsletter, ICLEI Africa reflected on the process of using scenario planning and future’s thinking to develop the 2030 low-emission development visions and strategies in two South African Steve Tshwete and KwaDukuza municipalities. community was identified as a community with vision and dedication towards a more sustainable future. 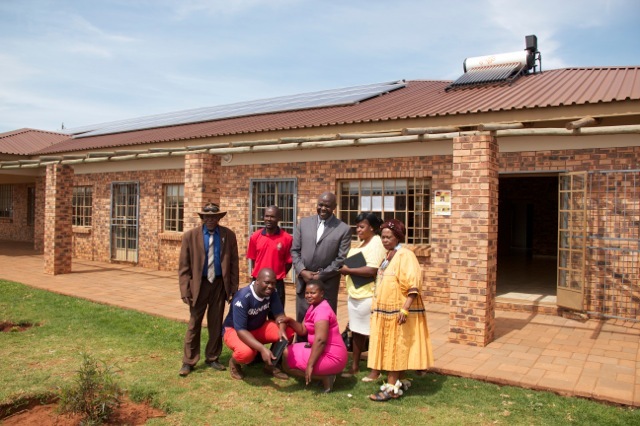 An 18kWp solar PV system has been installed at the Doornkop Community Centre, which is used for various purposes including a soup kitchen, Community Public Works Programme activities and adult education. The system boasts 68x 260w solar panels, 32 batteries and six inverters. It can be used during the daytime for appliances in the community centre, crèche and Old Age Day Care Centre, while also providing lights at night for a few hours. The solar PV system paved enabled additional security lights to be installed around the community centre and surrounding buildings. In an area normally totally dark at night, a solar streetlight was installed at the entrance to the centre to also provide light to the surrounding area. Two 150-litre solar water heaters were installed, on the roof of the Community Centre and caretaker’s home. For the first time the crèche and old age day care centre were supplied with plug points and internal lighting. To improve the quality of internal spaces for the crèche and old age day care centre, ceilings were installed in both buildings. This helps to keep the building warmer in the winter and cooler in the summer. In this off-grid community, the Community Development Workers team are now able to charge their cell phones which they use for capturing their work, the community kitchens have benefited from being able to use fridges, learners can study in the evening and community members can have meetings in the evening and use the data projector for presentations. 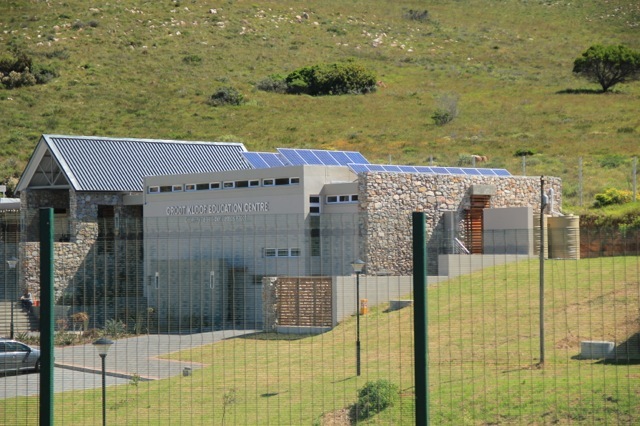 Nelson Mandela Bay Municipality prioritised improving the environmental performance of the Grootkloof Environmental Education Centre, situated in the Van der Kemp’s Kloof Nature Reserve in Port Elizabeth. 161 lights were replaced with efficient LED’ss and reduced the energy lighting demand by 59%. A solar water heater was installed to heat the water used in the showers, while the existing instant geyser was kept as a back-up. A total of 20 photovoltaic panels (255W) were installed, with a battery backup and grid connection, which allows excess energy to be fed into the grid. This can provide an estimate of 7950kWh/a, which is a saving of 7,8ton CO2 and 34,4kg SO2 per year. The system operates all the lights, offices and classrooms during load shedding. A smart meter was installed to allow grid tie and feed in. This has become a living example of NMBM’s policy towards small scale embedded generation locally. Water and energy demand are inextricably linked. A 3-phase water filtration system with a particle filter, ultra-filter and UV filter of up to 22,500 litres was installed for the rainwater harvesting at the centre. This provides water that is in line with potable water standards and the municipal water connection is now only used as a back-up supply, if required. To display some other practical solutions to the local community the centre also received a Mobiya mobile solar PV with LED light from Schneider Electric, a Wonderbag insulation cooker and counter top compost container. These cost effective solutions can be implemented by any household as part of their contribution towards reducing carbon emissions. The project also implemented the lighting retrofit of the Empangeni library in uMhlatuze, and implementation of Solar PV panels. This included 23 panels of 260w each, which provides a potential capacity of 6kW, linked to an inverter and eight batteries. 337 lights were replaced with LED lights, which led to a60% reduction in energy consumption for lights. The Mphe-Thuto Primary School in Magaliesburg also participated in the project where a solar water heater and skylight was installed, while all the lights were replaced with energy efficient lights. Working with other partners the school also received solar PV, bio-digester and food gardens to help them on their journey to be more sustainable. 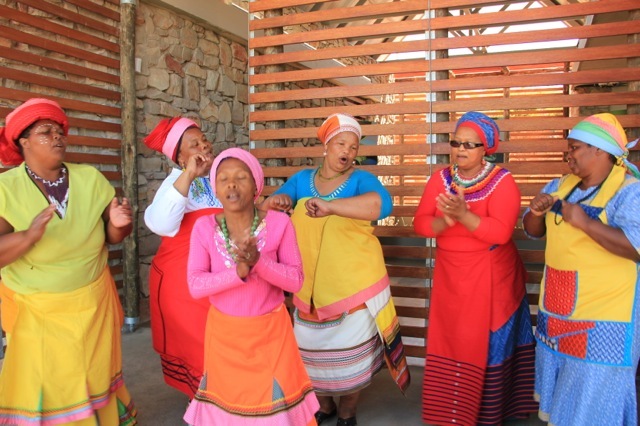 As a showcase of what can be done at home, twenty care homes managed by the Child Welfare Association in Groutville, KwaDukuza Municipality received food gardens, Wonderbags, and Mobiya solar LED lights. Solar water heaters are planned before the end of the project. All the showcase projects have successfully demonstrated, in a practical manner, that resource efficiency and sustainability is both relevant and beneficial for people across the socio-economic spectrum, contributing to a local and global effort to reduce emissions and adapt to climate change. The projects have sparked significant political and community interest; galvanising support for the sometimes complex issues of energy efficiency and resource security. The Urban-LEDS project is funded by the European Commission, and implemented in partnership with UN-Habitat.